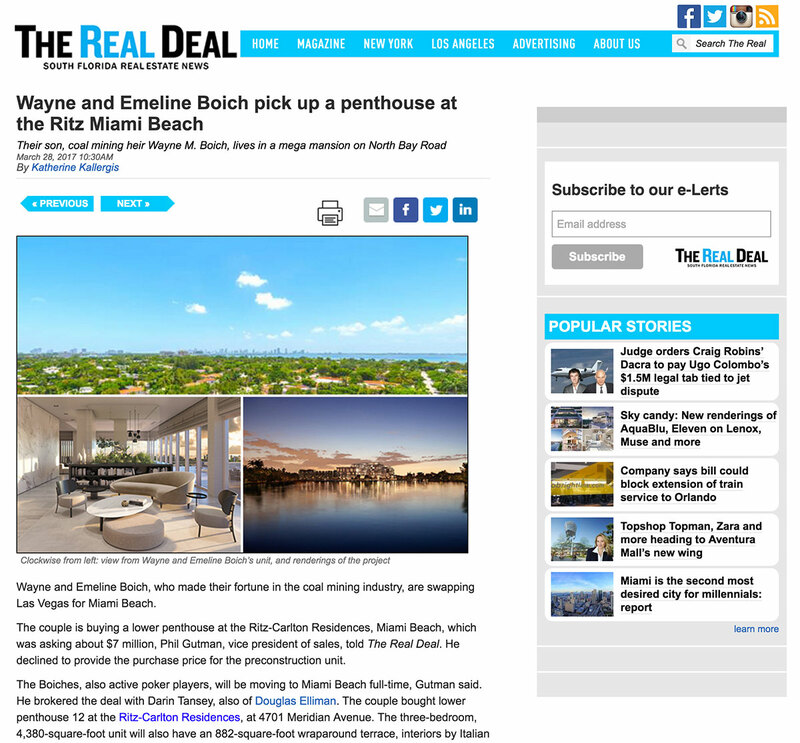 Wayne and Emeline Boich, who made their fortune in the coal mining industry, are swapping Las Vegas for Miami Beach. The couple is buying a lower penthouse at The Ritz-Carlton Residences, Miami Beach, which was asking about $7 million, Phil Gutman, vice president of sales, told The Real Deal. He declined to provide the purchase price for the preconstruction unit. The Boiches, also active poker players, will be moving to Miami Beach full-time, Gutman said. He brokered the deal with Darin Tansey, also of Douglas Elliman. The couple bought lower penthouse 12 at the Ritz-Carlton Residences, at 4701 Meridian Avenue. The three-bedroom, 4,380-square-foot unit will also have an 882-square-foot wraparound terrace, interiors by Italian architect Piero Lissoni, a private elevator and 11-foot ceiling heights. If sold for its asking price of $7.033 million, the sale would break down to about $1,606 per square foot. They’re joining their son, Boich Companies CEO Wayne M. Boich, who built a mega mansion on three lots on North Bay Road about three years ago. Lionheart Capital is developing the waterfront, 7.5-acre Ritz Carlton Residences, Miami Beach, which is being built in a primarily single-family home neighborhood on the site of the former Miami Heart Institute. Gutman said the quiet neighborhood appealed to the Boiches. “When you see a family, who could purchase anywhere they like … A lot had to with the location and the level of the finishes,” he said. When it’s completed by the end of this year, the development will have 111 condo residences and 15 single-family villas. Prices range from $2 million to more than $40 million. The project is more than 65 percent presold to families and end-users from New York, South Florida and various countries, Gutman said. Designed by Lissoni, the Ritz-Carlton Residences will feature gardens, pools and 36 private boat slips. Shared amenities will include a residential art studio, a rooftop pool deck with private cabanas and a gourmet restaurant, a waterfront bar and social room, pet grooming facilities, and indoor and outdoor yoga studios.